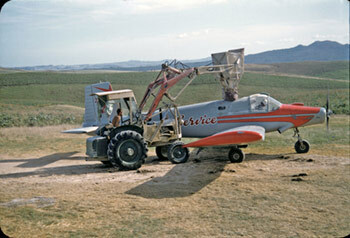 Bev from Nelson contacted me about getting some images repaired from old negatives. The negatives had been stuck together and when pulled apart Bev discovered the tears. She got me to scan the images (5 negatives) and chose three to be repaired. 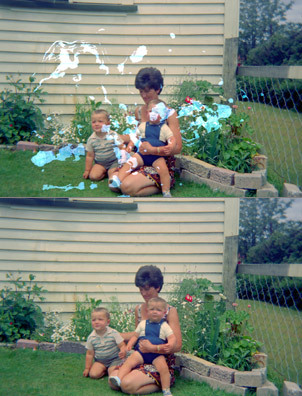 This one was taken in 1969 in a small town in the South Island, the two little boys were 12 months and 2 years three months. I removed all the marks, making them look great again. 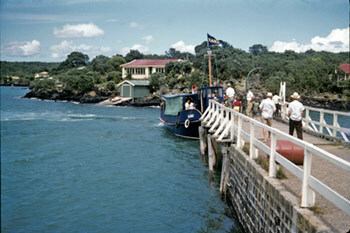 John sent me a series of slides of Motutapu Island off the Auckland coast to be scanned and copied. 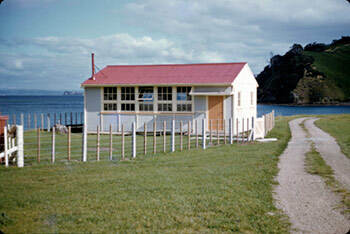 They were taken in the 1950s by school teacher Ray Coates. The pictures are of a top dresser loading up for fertiliser, the island wharf, and the then just completed island school classroom. John says today the island is poised to become the largest island recreation park in New Zealand, throuh the efforts of thousands of volunteers who are revegetating the island to provide habitats for endangered species. All the slides scanned will be used on a website about the island. Brent came to see me about making a great 6oth birthday – glass slide scans put onto a mounted canvas. Brent’s father had been to see me about 2 years ago wanting some old glass slides scanned and put onto CD. They were old glass slide adverts used at the Thames cinema back in the 1920’s. 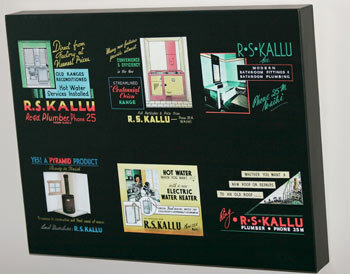 Brent’s great grandfather ran a very succesful plumbing business advertising all sorts of supplies – paints, timber, stoves, plumbing fittings and more. Brent wanted six slides made into a square then printed onto canvas and mounted. We chose the ones he wanted and it which order whereupon I resized them, did the canvas print then mounted it. All done in less than 48 hours as Brent had forgotten and only just remembered! Brent was over the moon about the final print and now has ideas of having tea-shirts made commemorating the adverts. 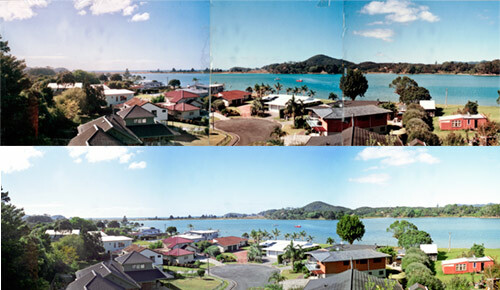 Ellen from Tauranga emailed me enquiring about having a canvas print made from the scan of a 35mm negative. I told Ellen this wouldn’t be a problem, I’d be happy to help her. Ellen mailed the negative along with instructions where the canvas should be divided into. 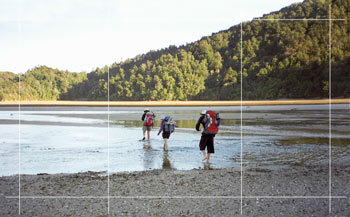 It was a photo they’d taken while walking the Abel Tasman Track, South Island, New Zealand, and was around 6am while they were crossing the Awaroa Inlet at low tide. Terry was with the 161 Battery Artillery. 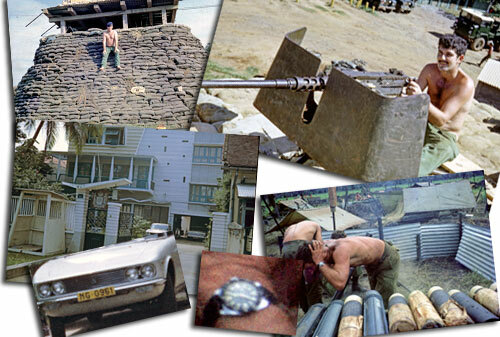 He’s in the top left image posing on the sandbags, with shots of his mates and military equipment. Another closeup shows the watch on the soldier as they fire a mortar during an exercise. It’s 11.40am, nearly time for lunch! Bev Taylor called to enquire about having one of his art works printed onto canvas. I told him that I could indeed do it and explained some of the options available- ie just making a giclee canvas reproduction print or having it mounted on a frame as well. Bev liked what he heard so took a one hour drive from Kaiwaka to see me. I showed Bev some of my previous canvas prints and some of the gliclees I had done for other customers. 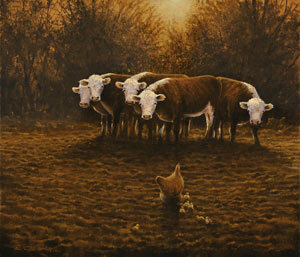 Bev liked my work so showed me his original painting of this wonderful farm yard scene of cattle and chickens staring at each other. 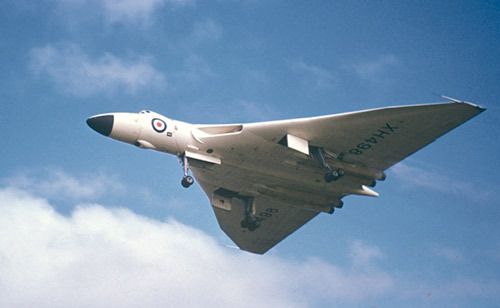 He also had a slide image of the painiting, professionally taken a few years previously. The slide was scanned while Bev was here. We colour corrected the image on the screen until we had it looking as similar as possible to the original. I suggested to Bev I make a small canvas print proof with coating to make sure he liked the final result. I mailed the proof to Bev a few days later, with Bev calling me to say he liked it and go ahead with the final print. 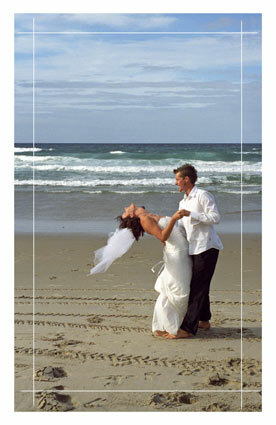 Lynette came to me with this wedding photo to be put onto canvas. It’s a picture of her daughter and new husband. This was originally taken on a film camera – this particular photographer still shooting with film. Using the Nikon 9000 negative/slide scanner, the 35mm negative was scanned at the highest resolution of 4000dpi. The photo was then printed onto my Breathing Color Chromata canvas, coated and gallery wrapped to produce a stunning 760mm x 440mm photo. This image shows the border where the canvas print wraps around the frame. Lynette called me back to say her daughter loved the canvas print and it’ll take pride of place in her house. 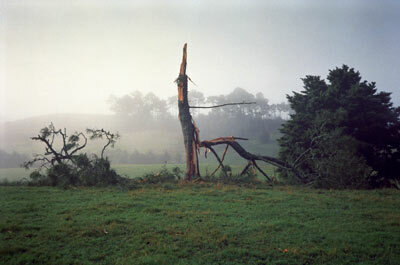 The Crams came to see me about having a canvas print made of a tree that had been struck by lightning on their farm 15 years ago. They had seen a triptych (pronounced “trip-tick”) of a tree I had done for myself and thought their own one would look great. 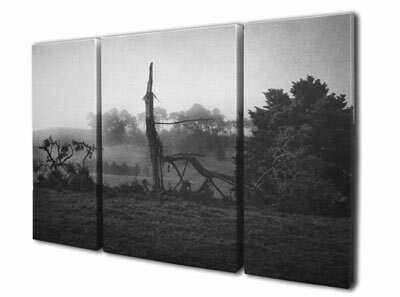 Triptych canvas prints are divided into three pieces, normally with the centre piece being the bigger of the three and having greater emphasis. The image was scanned from a 35mm negative using the Nikon 9000 negative and slide scanner. This produced high resolution photo that was then turned to black and white and printed on canvas, then mounted on three frames measuring a total of 900mm x 600mm and producing a stunning image.